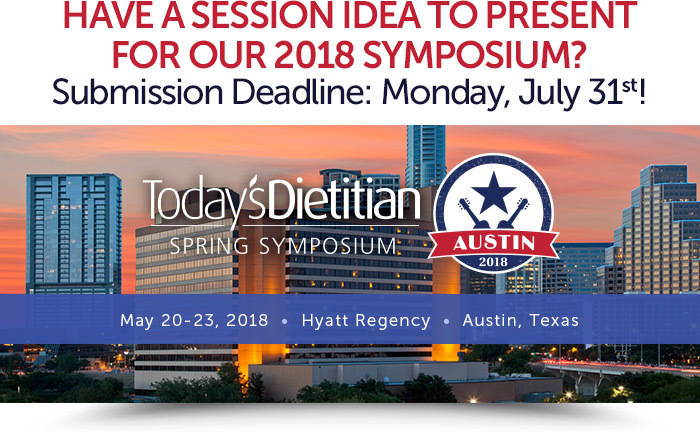 Are you interested in presenting at the Today's Dietitian 2018 Spring Symposium in Austin, Texas on May 20-23? If so, then we invite you to share your expertise with your colleagues! Individual or group proposals for 90-minute continuing professional education sessions are now being accepted for consideration. Abstracts will be accepted now through July 31, 2017! Your abstract should be submitted as a Microsoft Word file via email symposium@gvpub.com. Click here for printable instructions. The venue is conveniently located near Lady Bird Lake, a hiking/biking trail, and South Congress Bridge, which puts you just steps away from downtown Austin. We think this year will be our biggest and best year yet, so we’d love for you to be a part of it! Visit TodaysDietitian.com/SS18 for more program details coming soon!